1,100,000 units of housing. 6,200 miles of boulevards. 2,000 schools. $45 billion dollars. 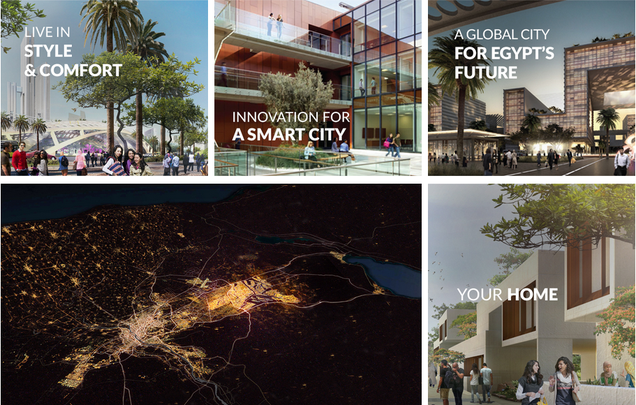 Egypt is planning a sparkling new capital outside of Cairo, and it wants to do it fast. As we wrote last week, Egypt hosted an economic development conference in which it detailed plans for a massive new pyramid. But it also announced an entire new city: A project called The Capital Cairo, designed by the American architects at Skidmore Owings & Merrill, the designers behind everything from the Burj Khalifa to One World Trade Center. The BBC reports that the glimmering plans have "attracted pledges worth [$12 billion] in aid and investment from Kuwait, Saudi Arabia and the United Arab Emirates." The city isn't just being built by the Burj's architects. It's also being built by the businessman behind the Burj—a UAE entrepreneur named Mohamed Alabbar who is heading up the investment fund that will finance the project. "It is a wonderful opportunity to be able to design something from scratch, and to design it keeping in mind the needs of the Egyptian people and the Egyptian government," Alabbar told the BBC. It seems Egypt's leaders are hoping to replicate Dubai's glittering urban forms—which themselves have been plagued with problems, both social and economic. But setting aside the Burj for a second, it's worth pointing out that Egypt is in the midst of a severe shortage of low- and middle-income housing in its real-life cities, while there's a glut of high-priced units. There are reportedly up to 20 million people living in illegal "informal" housing without basic amenities. 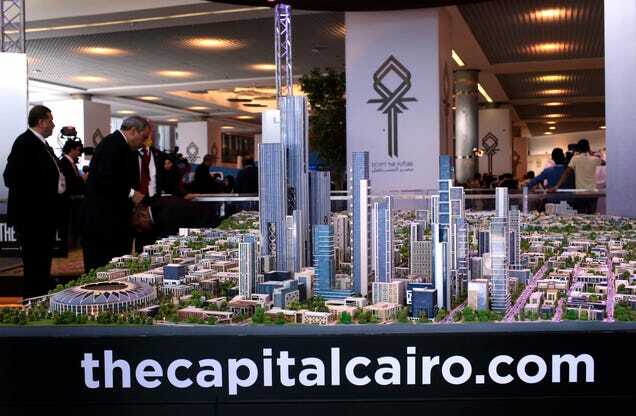 But while new housing is desperately needed, it's unclear how the government plants to tackle the crisis in Cairo while focusing on building a brand-new capital. So how to Egyptians feel about the plan? The Washington Post points to a blistering response from Egyptian historian and professor Khaled Fahmy, who called the project "chasing mirages in the desert:"
With 66 billion USD Cairo could easily solve the problems of transportation, housing, sanitation and garbage collection. With 66 billion USD we could solve the problems of Cairo's inner cities where 63 % of the city's inhabitants live. We could provide them with all the basic needs that they have been deprived of over the past fifty years: potable water, health care, clean air, recreational facilities and much more. With 66 billion USD we could improve the living standards of millions of Cairenes and of Egyptians who, at best, are dealt with as second-class citizens in their own country. But no, our Dubai-intoxicated political, military and economic elites want to turn their back to a history that goes back for thousands of years and to pretend that Egypt is a tabula rasa on which they could draw their depraved dreams for the future. More seriously, these deeply corrupt elites are willing to turn their backs to their own people. They yearn to have a new Egypt, with a new capital, and a new people. The weirdest part, maybe, is the schedule: The Guardian's Egypt correspondent, Patrick Kingsley, says the project will be built in five to seven years, a timeline so tight it's virtually impossible. It can take that long to build a single skyscraper, much less a full city with dozens of towers, millions of residential units, and a 1.5-square-mile theme park. Egypt’s businessmen union held a meeting Monday 21st of JANwhich discussed the consequences of the falling exchange rates of Russian, Ukrainian and Belarusian currencies on Egyptian tourism and exports. Ahmed Balbaa, head of the tourism committee at the Egyptian Businessmen Association, said the Russian ruble’s decline against the US dollar had caused a fall in the numbers of Russian tourists to Egypt by 50 percent. He also noted that the exacerbation of the currencies’ black market has also doubled the drop in tourism deals. As a way out from the crisis, Balbaa suggested that commercial exchanges between Egypt and Russia be made based on an exchange of the currencies of both countries. He explained that if that the barter system is applied, it would help reduce foreign spending, alleviate currency fluctuations and lessen losses in tourism and exports. Balbaa also suggested a reconsideration of rates quoted for hotel reservations as well as taxes imposed on tourist and hotel services.